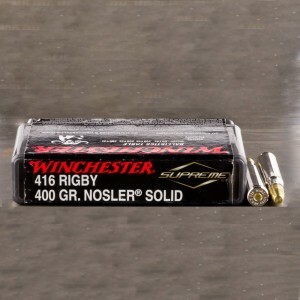 Designed more than 100 years ago, 416 Rigby ammo is one of the most powerful dangerous game cartridges designed for shoulder-fired, off-hand shooting. 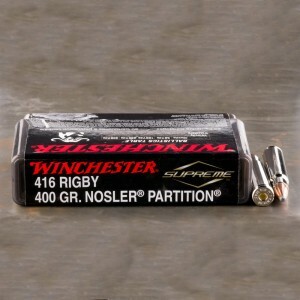 The mighty 10.6 x 74mm is capable of putting down the most dangerous game in the world. The .416 Rigby was designed by John Rigby and Company, a firm based out of England. In fact the English are famed for designing cartridges perfect for hunting in the so called ‘dark continent’. These rounds were designed for the dangerous game of Africa. 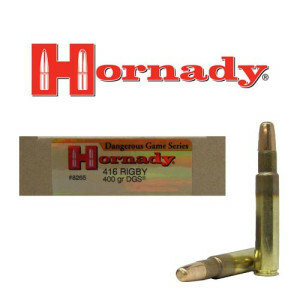 The Magnum size cartridge has fluctuated in popularity during the decades, depending on the interest in African game. The 416 Rigby is quite popular at the moment since a renewed interest in African hunting exists at the moment with the growth of modern conservation efforts in Africa. The 416 Rigby is immensely powerful and is capable of penetrating the thickest skinned creatures like the cape buffalo, and big cats. In terms of North American game, the round is significantly over-powered for most game. The only game that make sense for the 416 cartridge on the continent would be polar bear and the American buffalo, but due to protected status of both creatures --- the cartridge is somewhat useless in the Americas. The 416 Rigby’s power is so much it can push a 450 grain round up to over two thousand feet per second.